Q. When is your conference? Q. What are your registration dates? A. Early registration ends on June 30, 2015. Late registration is July 1, 2015 – September 30, 2015. Q. Who may attend the conference? A. Those who register for the conference. Access to all conference activities, including scientific and poster sessions, is restricted to meeting registrants only. Badges are required for entry to all conference activities. Q. How do I register for the conference? A. Please click here to view our Registration page for detailed information. Q. I am having difficulty with registering on-line. How else may I register? Q. I am at the UCLA CTO website and am ready to fill out the billing information. There are two data fields I’m not sure about, “Title” and “Free-form information.” What information is being requested here? A. Your title includes Dr., Miss, Mr., Mrs., and Ms. “Free-form information,” which appears directly below Country, is a space where you can type in the name of your country if your country is not listed among the choices in the drop menu. Q. I want to attend the conference but missed the deadlines. May I register in person on-site on the day of the event? A. Registration (and seating) is on a first come, first served basis. We recommend you register by the deadlines (Early Registration ends on June 30, 2015; Late registration is July 1, 2015 – September 30, 2015). Afterwards, walk-ins accepted on a first come, first served, space availability basis. Seats will be sold at the event only if there are openings. Please click here to view our Registration page for detailed information. Q. I am only able to attend on one of the days, not all 2. Would I pay a reduced registration fee? A. No, the registration fee is a flat fee; it is not prorated. All attendees pay a flat registration fee, regardless of the number of days they attend. Q. What is included in the registration fee? A. Admission to the conference, daily light breakfast, lunch, and coffee breaks. Q. Are there any other fees, in addition to the conference registration fee, that I need to be aware of? A. UCLA CTO/Ticketmaster will assess a separate and non-refundable “per ticket” fee of $6.00 and a non-refundable “per order” fee of $4.95. Please note that the “per order” fee is a charge per transaction, NOT per ticket. For example, if you pay for 3 general public registrations in one transaction, you would pay a flat $4.95 per order fee. These two fees will be assessed to all registrants and are in addition to the conference registration fee. NOTE: You are charged this transaction fee only if you register on-line. You will not be charged this transaction fee If you register by fax, by mail, or in person at the UCLA Central Ticket Office. Q. I’ve registered. Will I receive a ticket or confirmation form as proof of registration? A. We will send an order confirmation, and tickets will be mailed to US customers. International customers may pick up their tickets at the “will call” table at the venue. Q. How will I get the order confirmation? A. We will send customers a confirmation e-mail after we have received their completed: (1) Pre-registration form, (2) Payment registration form along with payment of the registration fee, and (3) copy of current photo student or University of California Faculty or Staff Identification, if applicable. Q. Will I receive anything on the day of the conference? A. Yes. On the day of the conference, you will receive a conference packet, which includes (1) your name badge, (2) conference program, (3) evaluation form, and (4) information on the meals. Q. Do I have to wear my badge each day of the conference? A. Yes. Your badge is your proof of registration, and is included in the conference package that you will pick up on the day of the conference. You will not be admitted into the conference venue if you do not bring and wear your badge. Q. Will conference scholarships be available? (2) Current University of Southern California (USC) and McGill University graduate students and postdocs only if they are members of FPR Program for Culture, Brain, Development, and Mental Health (FPR CBDMH). You must attend all 2 days of the conference in order to be eligible for a refund. At the end of the conference, you will receive instructions on how to process your request for a refund. For detailed information on how to apply for an FPR Conference Scholarship, please visit our Conference Scholarships page. Q. Who is eligible to apply for and receive a conference scholarship? A. Current UCLA graduate students and postdocs from the above selected departments and programs, and current USC and McGill University graduate students and postdocs who are members of FPR CBDMH are eligible to apply. Completed applications with all required materials must be received by the June 15, 2015 deadline. Applications will be evaluated according to “closeness of fit” of applicants’ academic and research backgrounds, achievements, and current work or studies relevant to our conference topic. All eligible conference scholarship applicants, as describe above, may apply in person at UCLA Central Ticket Office (CTO), located at the James West Alumni Center, and provide completed applications and required materials at the box office window. All eligible conference scholarship applicants may also submit their completed applications and required materials by fax to UCLA CTO: (310) 206-7540 or (310) 825-9265 (alternative fax), or by mail to: UCLA Central Ticket Office, PO Box 24607, Los Angeles, CA 90024-0607. Please also submit your brief research paragraph and current curriculum vita online. Q. Why do ‘scholarship’ applicants have to pay the $135 students fee first and get refunded later? A. The purpose of our ‘scholarship’ program is to support current UCLA graduate students and postdocs (and current USC and McGill University graduate students and postdocs who are members of FPR CBDMH) who really will attend the interdisciplinary conference in entirety. Our past experiences showed that when we offered a large number of free invitations and conference scholarships without any deposit, consistently only a small number of them actually showed up at the events, despite multiple positive confirmations to attend. Unfortunately such practice prevented many seriously interested scholars and general public from attending the conference, because we had to reserve the limited seats for those who confirmed. Based on the advice we gathered from UCLA campus, we finally followed the commonly practiced “payment deposit & refund” system to secure a “free” seat. Q. How does the conference “scholarship” program work? There are a very limited number of conference “scholarship” available: Eligibility is based upon “closeness of fit” of applicants’ academic and research backgrounds, achievements, and current work or studies relevant to our conference topic and complete set of their application materials, to be received by June 15, 2015. Eligible applicants may deposit a check of $135 (Conference Registration Fee) payable to the UC Regents at the CTO and pay the CTO non-refundable per ticket fee of $6. Eligible applicants may also submit a completed payment registration form, including their credit card information, plus the non-refundable per ticket fee of $6. CTO will hold the checks (or credit card information) up until the end of the conference. You will be notified shortly after June 15 if you were selected to receive a conference scholarship. Eligible applicants, who attended the entire 2-day conference, would receive their $135 checks (or payment registration form with credit card information) back at the end of the conference. The CTO/UC Regents will then cash in the remaining checks and debit the credit cards of the “no-shows” or conference scholarship awardees with incomplete conference attendance, to defray the actual costs of unsold seats. Therefore, the upfront share of the “scholarship” applicants is the $6 CTO non-refundable per ticket fee, that all CTO clients must pay to get a ticket, as a token of serious intent to attend the event. As the actual CTO ticket processing costs are higher than $6, the FPR supports the remaining costs. Q. What determines which applications will receive a conference “scholarship”? A. Applications will be evaluated by a conference scholarship review committee. The applications will be evaluated according to “closeness of fit” of applicants’ academic and research backgrounds, achievements, and current work or studies relevant to our conference topic. This information will be taken from the required brief paragraph describing your research interests, current work or studies that are relevant to the conference topic, why you would like to attend the conference, and how it would be useful to you, as well as your current curriculum vita. Q. Why do conference “scholarship” applicants have to attend the 2-day conference in entirety? A. Because it is an interdisciplinary conference. You will get the whole picture only by attending all the sessions. A. Written requests for refund must be faxed or received or delivered in person by June 30, 2015, to receive a full refund of the registration fee (there is a processing fee of $20 for all refunds, which is separate from the registration fee). Written requests for refund received from July 1, 2015 – September 30, 2015 will receive a refund of 50% of the registration fee (there is a processing fee of $20 for all refunds, which is separate from the registration fee). No refunds will be issued after September 30, 2015 (including no-shows). Please fax your refund request to: UCLA CTO (310) 206-7540 ** or ** 310-825-9265 (alternative fax). Alternatively, mail your refund request to: UCLA Central Ticket Office, PO Box 24607, Los Angeles, CA 90024-0607. A full refund of the registration fee will be issued if the conference is canceled, discontinued, or rescheduled. For questions about registration, payment processing and refunds, please contact UCLA’s Central Ticket Office: (310) 825-2101. Q. I submitted a written request for a refund. When will my credit card account be credited with a refund? A. A refund will be credited to your monthly credit card statement approximately 2-4 weeks upon receiving your written request for a refund. Q. Will you be offering continuing medical education (CME) or continuing education (CE) credits for attending this event? A. No, we will not be offering CME or CE credits for attending this event. Q. Are there hotels that have been reserved for attendees? A. If you need accommodations, please contact the hotels directly. Please click here for a list of some nearby hotels. Q. Where will the conference be held? Q. What will the seating be like at the conference venue? A. Seating at the conference venue is very limited. A. To obtain a daily parking permit, please go to the information kiosk on Westwood Plaza, north of Le Conte Ave., adjacent to Parking Structure 9. The closest UCLA parking structure to the NRB is Parking Structure 9, but please park where directed by UCLA parking staff (they may direct you to other parking structures, on a space availability basis). Q. What bus/metro route do I take to UCLA? Q. I use a wheelchair. Will the venues be wheelchair accessible? Q. I am visually impaired and I use a seeing-eye dog. Will I be permitted to bring my seeing-eye dog to the conference venues? Q. I was not able to find a babysitter but I’m registered for the conference. May I bring my children to the conference? A. No. Unfortunately, conference seats are reserved only for confirmed registrants. 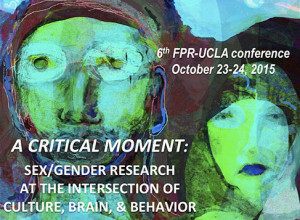 Q. I have registered to attend the FPR-UCLA conference. While I’m on the UCLA campus, I would be interested in making contacts or network with UCLA academic departments, for my own personal, academic, or career development purposes. Would the conference organizers be available to assist me with this matter? A. The conference organizers are NOT available to assist in this personal matter. Also, conference attendance does NOT mean that you will have automatic access to UCLA academic facilities or programs. Anyone interested in pursuing any academic activity, research, etc. at UCLA should initiate contact with the relevant department, according to the appropriate departmental channels and procedures. Q. I am interested in attending the conference, but I am an international scholar. What are the procedures for obtaining a visa to travel to the U.S. to attend this conference? Q. The conference agenda contains several sessions. What scientific areas will be covered in the presentations? A. Anthropology/culture, biology/neuroscience, history, psychology, and psychiatry, among other fields. Q. I have questions to ask of some of the presenters during the conference. Will I be permitted to ask them? A. Yes, time permitting, during the discussion period at the end of each scientific session. Q. Am I allowed to bring a tape recorder or video camcorder to make a record of the conference and Keynote presentation? A. No. Audio and visual recording of conference and Keynote presentation content by attendees is not permitted. Q. Will conference attendees be permitted to bring food and drink into the conference venues? Q. I have questions or comments for some of your presenters that I was not able to ask during the conference. How may I reach them after the conference? A. Please see Participant Contact List in your conference program. Q. I really enjoyed the presentations of some of your speakers. How may I obtain copies of some of their articles? A. Articles from the presenters will not be available at the conference. However, there will be a handout that lists the URLs of presenters’ websites and articles or other works, for those presenters who wish to disseminate this information. We encourage attendees to contact the speakers directly, either through the contact information included in the conference program or in person at the conference. Q. Will you be publishing anything based upon the presentations from the conference? A. There is a plan for publishing the results of this conference. Please check back for further updates. Q. Is the conference a tax-deductible educational activity? A. Please check with your tax professional. The FPR and UCLA (including CTO) do not offer tax advice. Q. How do I get on your mailing list? A. In addition to sign-up sheets at the conference, you may visit our Contact FPR page to sign up on-line. Q. Where may I find more information about your future conferences? A. Please keep visiting this website. Q. Who is the artist and what is the title of the conference logo?